I don't deserve credit, pretty much everything I've said has been paraphrased from @Mighty Alicorn Hunter who has posted about this a bit on the Tabletop Herds Discord with my little bits of my speculation put in. you see the same Ying/Yang type thing with Baphomet going on behind FHTNG. Another thing from Mighty, in this image you can clearly see several demons, two of which actually have little names under them. "Dave" and "Steven." I guess Fred brought friends? What did you two find that points it to being Latin? 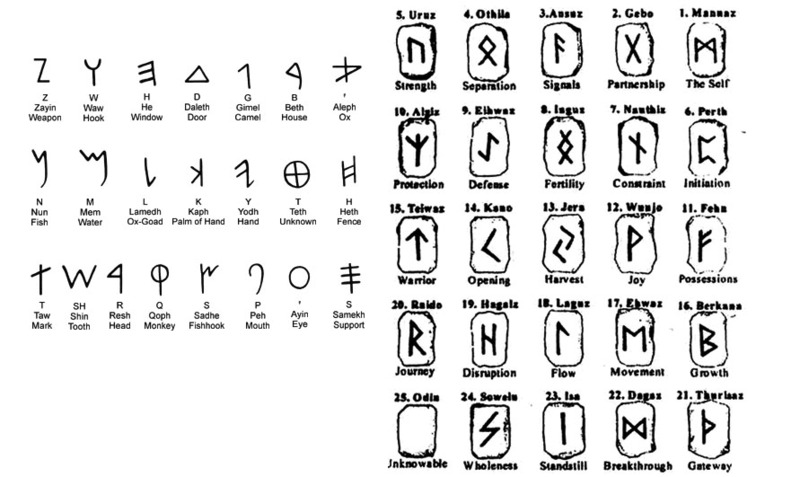 Last one is the same, second last is also the same, but mirrored, arrow runes could be P and L, that deformed H looking thing doesn't fit any shape, though. The W is pretty close to a ringer in this one. Demon.png in the backer wallpaper set also has runes, which may or may not be repeats of bits of the twitter announcement. Also emphasis on a few of the words in the text (Oleander me me She art thou my presence). I need to mention that after looking back to that picture, I realized that those demons in the background are also in this picture. This most likely means that they are, in fact, Fred. Perhaps some early art that didn't double up on his horn count. Sad, but most likely true. Edit: Also just to update everyone, the runes in the background have been removed. The default background is seemingly reverted to how it was before they added the runes. Someone might wanna check that for hidden goodies. I already did if you go from page to page you see them for a second before the actual background comes up also I don't think its Fred bc if you look there is a very brawlic one and a very scrawny female looking one cleaning. (A housewife and a strong guy) the opposites... Don't think its a coincidence that Baphomet represents opposites. There is a sort of wall or something preventing you from going in, You found an opening and went through, You found another wall, This time with people protecting it! You use weapons to fight them off and someone helps you or you help someone. Now you can take this and say that the wall = fence, the broken gateway = opening, the other wall = fence, people protecting it = defense, fishhook = weapons, hand = help of some sort. Now I know that I'm going WAY outside the box but my sleep-deprived brain wants a solution until tomorrow and I think this satisfies it... #FanLore? Fence = The Holds Super Natural Lock breaks. Broken Gateway = Predators escaping the hold. Fence = Foenums Super Natural Lock breaks. Fishhook = The Key Keepers find the keys. Hand = Foenum is saved because of the Key Keepers. I'm gonna stick with that for now. So @Redness basically completely destroyed my entire theory by explaining that the foenecians (Sounds like Phoenician doesn't it...) lives were threatened daily by predators until The Bearded Prophet locked them away in a portal she called THE HOLD, they started coming back and explained that The Bearded Prophet's magic is finally wearing thin. They have broken her lock and will soon break the lock to Foenum. Champions are chosen from every nation and they have to go face The Devourer and save the world. These champions have to find the Enchanted Key and relock the portals. So now let's go back and rewrite that FanLore real quick. The portals are the fences since they are locked and fences prevent you from going in or out of places. The broken gateway is the broken lock on the side of THE HOLD, the defense is the champions because they are the last line of defense for Foenum from the Predators. The fishhook is used to find fish or to reel things in, OR WHAT WE ARE GONNA SAY is that they have to find the key so they go "fishing" for it, then the hand represents that they either help each other or they help Foenum. I'm trying to think around it, like it's 6 characters, two of which are the same. Hand: Someone or something offers a thing of value. Fishhook: Someone else (Oleander?) gets tricked into believing the offer. Defense: Victim learns about The Hold. Fence: The Hold acts as a fence, keeping predators away. Broken Gateway: Victim breaks the lock, releasing the predators, either willingly or otherwise. Second fence: I dunno, maybe cities start to wall up in preparation, remember how in the first trailer the snowy pixel lobby had great walls? I'm not sure if we're on the right track with the current rune chart. I wonder if any runes we're added to any of the other pics. I can't see the whole thing on my phone. It appears that the other 8 backgrounds do not have runes on them. The runes are just straight up gone. Are there any other noticable differences? Noticeable? No, besides that the background count doubled at some point. It was originally 4 excluding the blank/rune one, now it's 8. Though, I think you guys started after the backgrounds increased, so that's probably not a surprise. I think it was before. Maybe there's an order of events in the pics. The dots in the runes are throwing me off. There's no runic alphabet that I can find that has double dots on some characters. A few sources mention a double-dot character that goes between characters to break up words, but the ones in the (former) background are clearly part of the character, not between them. If you ignore the dots, each character can be found in some runic alphabet or another - except maybe the far-right character - but not all in the same alphabet! This makes me think it might have just been designed to look rune-ish without actually being a reference to anything. Or, maybe the devs are inventing their own "Fœnecian" script. That'd be fun. The dots in the runes are throwing me off. Me and redness noticed that they removed the runes some time last night around 1 am ish, and we did start before they added so many more backgrounds. Them removing the runes makes me think that it is something that we can find. Is there a 6 letter word in the lore that has the same letter either 1st and 3rd or 4th and 6th? The initials for the 6 characters. I've thought that too, but have no idea which of the runes are for the others and the order of pom and paprika. Edit: forgot to mention that I think the two similar symbols are A and V. If it is their initials anyways. I still think that they would be like "0_0 um... no. You guys aren't onto anything" or something like that. I'm still gonna go with the theory that they mean something until I'm proven wrong. Still, the order in which the runes appear seems to be arbitrary, we know that in the Book of Lore, Paprika is number 4, and Pom is number 5, maybe they are reversed and they hint the order in which the story mode will be released? I also noticed that "Baphomet" seems to be doing the dishes. One of the numbers is 1903, it could be a year, but I dont think so, because it would be too obvious. Assuming it is a year, Wikipedia has a page of "things that happened", I guess that all of this would be paranormal related and whatnot, so we have two notable births. Alexander Imich: Parapsychologist, oldest living man for a time. I'll try to look for more info, maybe tomorrow. Or maybe we should try another approach, how can we use Occam's razor in all this? If all this is just a wild goose chase, I think Mane6 would tell us, but only after Halloween. Just so they could say "Gotcha, it was nothing all along!" But I don't believe this is the case for several reasons (the runes being removed, Anukan's post, etc). I do wonder if they'll just tell us the answer after Halloween if it isn't cracked by then, though. Kinda just brute-forcing, I looked at words that fit the pattern of the runes (ABACDE), and the most promising outcomes (in my opinion) were "Awaken" and "Ninety". "Awaken" could just be referencing Oleander finding the book or something, and "Ninety" could be days, like ninety days from somewhen. Isn't there some letter to number code that needs a keyword? All we can do at this point is brute force the info that we know (which isn't much) until we find something. Brute forcing is useless because it gives infinite number of solutions. True, but something's got to give. Maybe there's a hint dropped by the characters in this post or from the one from Redness' page. Also, still no word from paprika, who does have an account like the others, though it doesn't seem like it's been set up like the other 6.